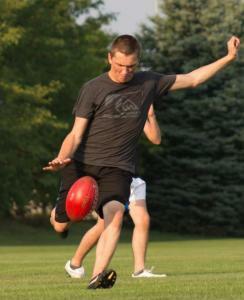 This past weekend was the first training in 2014 for Canada's international AFL squad Northwind, and is therefore the perfect time to give (albeit a little late) congratulations to James Duggan for being named to the team that will compete in the 2014 AFL International Cup this coming August. Along with being an established leader for the home squad - including two club Best & Fairest awards - Jimmy has also been a fixture at Northwind trainings since 2010, and was named Captain of the under-23 squad that traveled to Ohio on one of the many Parallel Cups that have happened over the years. Jimmy was the sole Dingo named to the squad for 2014, and will have the whole club supporting him in August. All the best Tugs, make the Dingos and Canada proud!